Doors to the main event will open at 8pm but we've added something special to the evening's fun by deciding to have a pre-event event. This will be in the Mini Works from 7-8pm and will be a social led affair where you can come down, meet the authors, your mates, long ago climbing partners and generally have a catch-up. 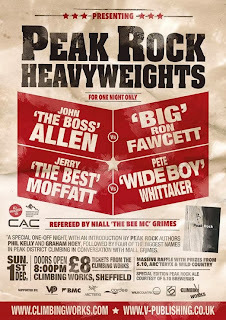 The book will be available to buy and with the great & the good in attendance this will be a great opportunity to get it signed by your Peak climbing hero. 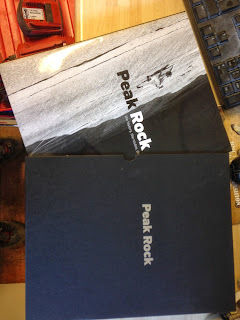 There will be music & beer provided by The Climbing Works and Arc'teryx (very special ltd edition beer bottles) which will be FREE for the crowd (but maybe throw some money into the charity boxes for good karma). Tea, coffee & hot chocolate can all be purchased from the cafe at the Mini & main Works. As it will be the start of December and the Climbing Works is essentially a big warehouse we encourage you to wrap up warm for the event. We open the main Climbing Works. Everyone who has bought a ticket will be on our list and we will get you into the centre as quickly as possible. Seating will be on a first come basis so be in the queue to get the best seats. Anyone at the Mini-Works will be able to pre-sign in but must still queue at 8pm (we have to make sure the Works is empty of climbing customers) but once in through the door you can speed onwards to grab seats. The main event. The authors will give a short intro and tell the story behind the book. 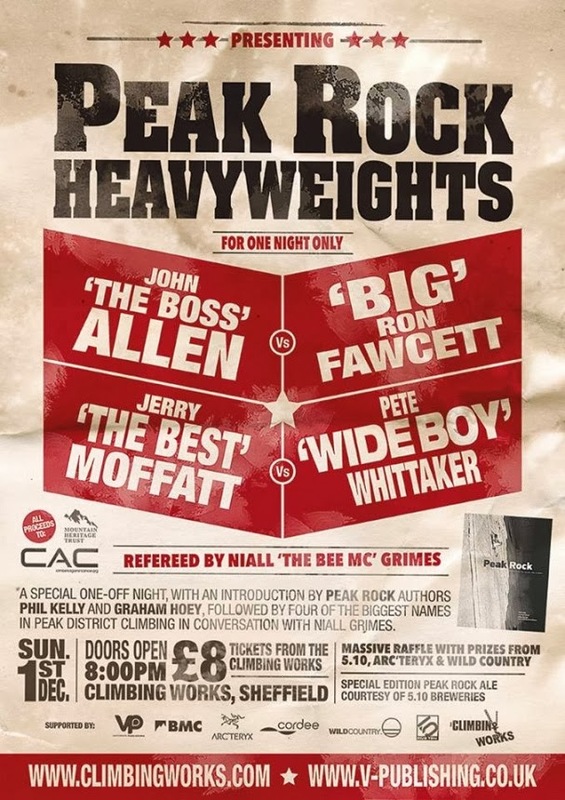 This will be followed by Niall 'the midget' Grimes taking the stage and interviewing each of the 4 peak legends we have for the show: Ron Fawcett, John Allen, Jerry Moffatt & Pete Whittaker. Post intermission we have a special competition that will be announced on the evening with prizes from Arc'teryx, FiveTen, Wild Country and more. To finish off we will have an open Q & A from the audience so get your thinking caps on! We should all be finished by 10.30pm.....'ish. The above is a short summary and we have plenty of small extras planned which should all make the evening an unforgettable event. p.s. there are no more tickets available. If we get any returns / cancellations we will announce it Sunday morning on our Twitter& Facebook page. IF there are any available you can ring the Works and buy them then. It's a BIG if.